We have by now over a hundred radiocarbon dates from our various sites. The majority – about three quarters – date to between 500 and 1300 AD, which appears to be a key period for the settlement of the area. However, we have inklings of earlier occupation, too. 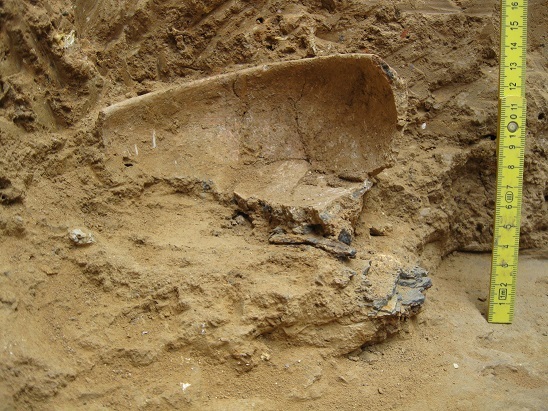 Until now, indications for this early phase, of the first millennium BC, came just from one site, Alibori Site 2, excavated by Didier N’D in 2014: as its name indicates this was close to the Alibori river, and not too far from Birnin Lafiya. There, two samples from Trench III (below) indicated occupation sometimes between the eighth and fifth centuries BC. 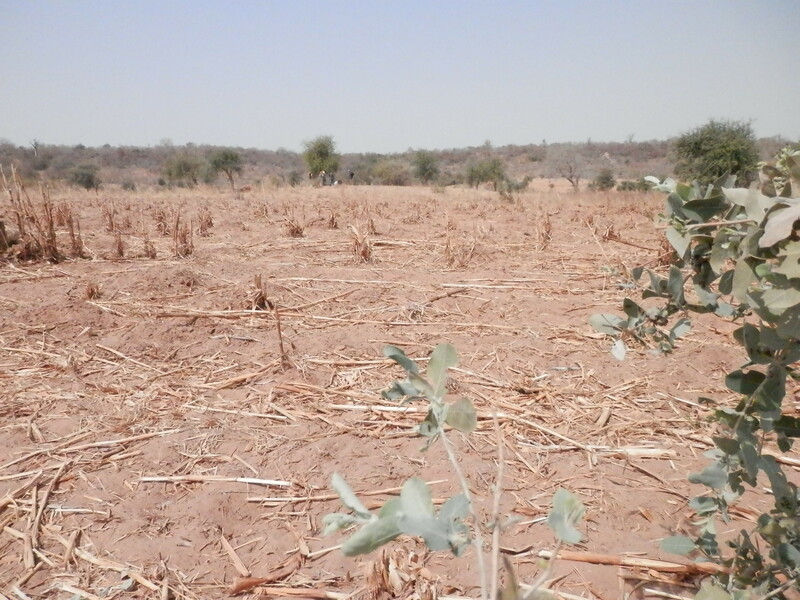 Now, with some new radiocarbon dates just received, we have confirmation of another early occupation, nearly 3000 years old, at a site called Kozungu, on a mound just outside modern Birni Lafia (photo below). 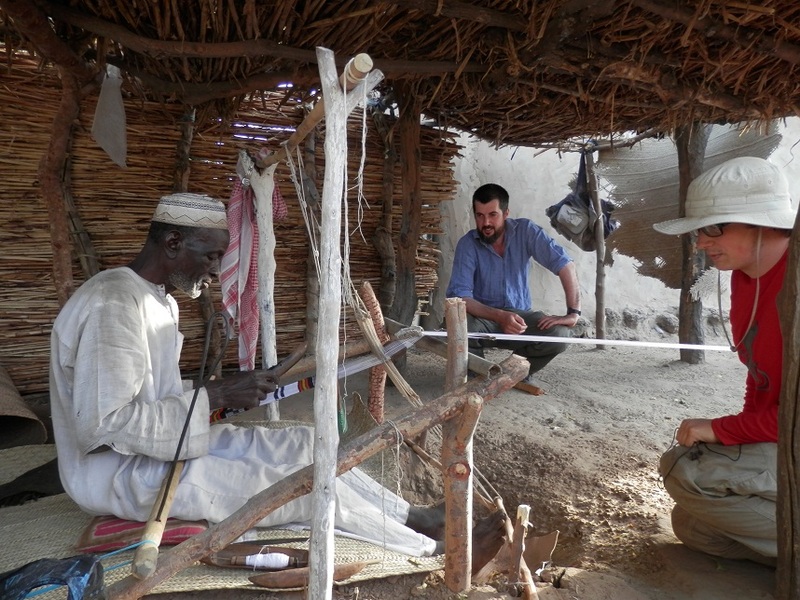 It was visited by the architects and ethnographers in our team, then subjected to test pitting by Ali LS, Nicolas N and Daouda A. These excavators had suspected there was an early occupation at this place, based on a discontinuity in the stratigraphy. That impression was confirmed later, during pottery analysis, when we found that the material from the lower part of the trench looked really different. Now we can suggest thanks to the radiocarbon dates that people apparently lived at Kozungu 3000 years ago then the site was abandoned and reoccupied at a much later date (13th century AD). It’s a nice result because it sheds a bit more light on the earlier inhabitants of Dendi, who preceded the people building pavements and using huge numbers of pots and who for that reason are much easier to spot in the archaeological record. 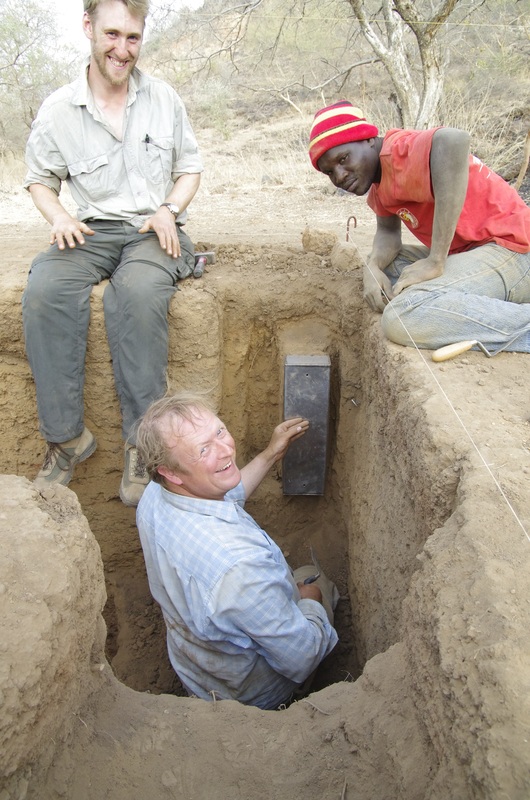 During the past field season we excavated a number of test pits within modern settlements. The aim here was to determine how long the modern villages had existed and what their material culture looked like in the past. The test pits were excavated in locations chosen after consultation with the ethnographer, architects, and oral historians within the team. This is a good example of the close interdisciplinary collaborative work we have been doing in Crossroads. The archaeological work was spearheaded by Ali, with able assistance from Nicolas, Idi and others. One thing which required constant explaining to interested viewers was why we were so obsessed with recovering charcoal. Of course the answer is that charcoal enables us to date events, through C14 dating – and we’re delighted to have just been awarded a grant from the NERC Radiocarbon facility on the basis of an application Ali and I wrote last April (and Nicolas and Louis helped out a ton with the sorting and graphics). This will allow us to run 21 dates on charcoal from five of our test pits. We chose charcoal from layers which we think fall in our 13th-18th century blindspot – the period for which we so far have no archaeological or oral historical information at all. Archaeologically, Ali and his colleagues determined that in the trenches this ‘invisible phase’ lies between the ‘early medieval’ layers, which are full of folded strip rouletted pottery – most of the Birnin Lafiya material looks similar to this – and the ‘early modern’ (these are just handy labels) which are characterised by totally different pottery including blepharis roulette, and by cowrie shells. Yesterday I finished the analysis of the Kompa Dune material. Since practically nothing is known of archaeological ceramic types from this part of the world – a situation in stark contrast with other sites I’ve worked, such as Maya Belize or Roman Geneva, where a handful of sherds can give you an instant clue about chronology – we are working from scratch. Some potsherds were eroded or undecorated, and tell us relatively little without further, expensive and time-consuming, analysis such as clay characterisation; we call them ‘Category 4’. Others were good-sized rim sherds, from which we can infer the shape and size of the vessel they came from; we call those Category 1. Now the hard graft of analysing these is done, I shall be putting down my Sharpie and callipers and dusting myself off to start looking for patterns and characteristics. This is essentially a question of playing with Access and Excel to see whether, for example, certain types of decoration only occur in certain stratigraphic layers. Kompa has yielded five dates – three were from our main trench, roughly eighth to late twelfth centuries, and the other two from a furnace operating just the other site of a stream, early tenth to mid-twelfth century. Read more here about our work back in January. The trench itself was not that informative in terms of past people’s habitat. We seem to have hit a trash heap: there were no discernible structures and nor did we recover any small finds such as beads or metalwork. However, the fauna and plant remains, and the pottery, will tell us quite a lot about how people lived. Archaeology is, after all, about the day-to-day discards. Finally, Kompa is unusual in one way: it’s not that common to find settlement and ironworking evidence side by side, as they were here. Partly because of this, Caroline RB and I will, over the coming months, be writing a paper with colleagues of hers concerning this site. 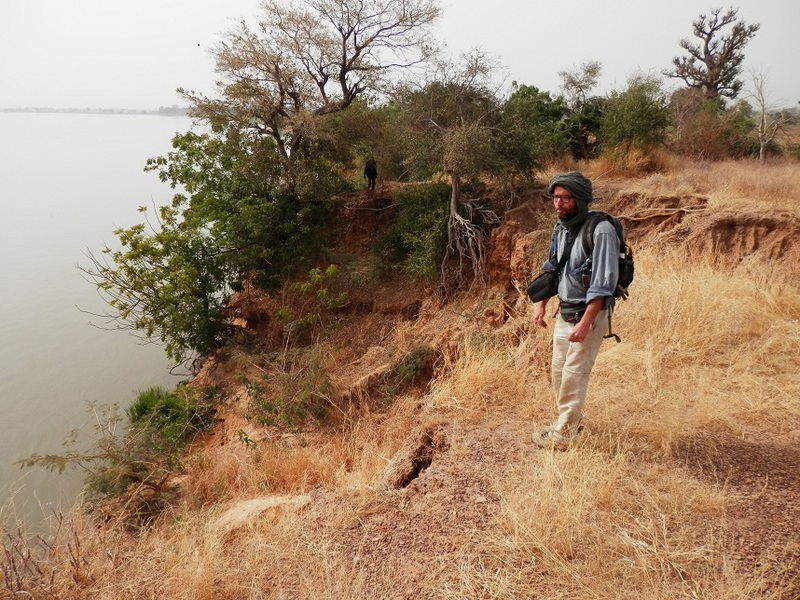 As followers of this blog will know, our European Research Council-funded team is engaged in clarifying the history and archaeology of northern Benin, in West Africa. Although the project’s core is archaeological, it integrates throughout art historians, anthropologists, geoarchaeologists and historians. Team members undertake fieldwork together, and there is a continuous feedback process throughout the field season, so we keep on track. We’re halfway through: how are we doing? So far, we’ve undertaken three field seasons, of which the largest, earlier this year, involved fifteen researchers, sixteen students, several research assistants and 40 workmen. At the moment we are engaged in desk-, museum- and laboratory- based work until the next field season in early 2014. Our archaeological work has focused on a site called Birnin Lafiya, where we have worked for three field seasons now – a total of perhaps 80 days. 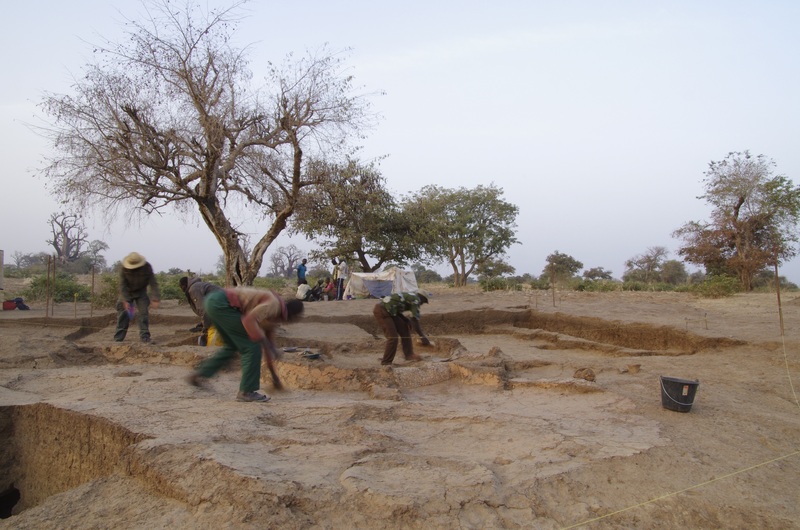 We have uncovered parts of floors made of broken potsherds and evidence of fired earth architecture, which is not so common an occurrence in the West African Sahel. 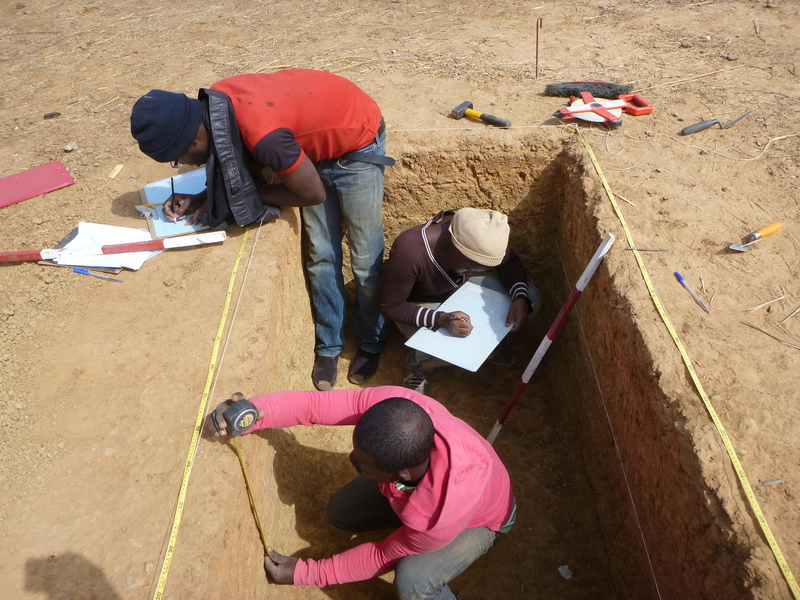 We have also carried out geophysical prospection to get a better sense of the extent of the site and to identify buried features; our work is one of just a handful of examples of the application of the technique in sub-Saharan Africa. Birnin Lafiya has yielded varied and diagnostic pottery, and good preservation of fauna and charcoal. We have so far recovered no occupation post-dating the thirteenth century, while the earliest remains date to the fourth century AD. We’ve also carried out test pits at four other sites throughout the valley, and very limited sampling at two further sites. These sites have yielded varied and diagnostic pottery and all fall within the same rough time range as Birnin Lafiya. At least two of the sites – Pekinga and Tin Tin Kanza – show evidence of the same tradition of pottery pavement; Tin Tin Kanza, in particular, revealed a close succession of pavements, wall bases and floor areas. At other sites, we recovered no architectural features, but the pottery analysis, which is ongoing, will allow us to suggest whether there is a degree of cultural similarity in parallel to the broad chronological simultaneity. 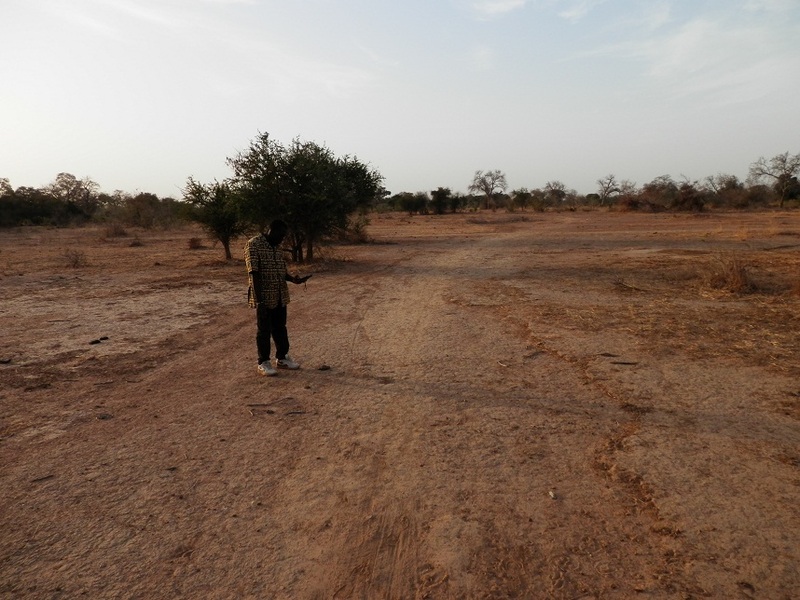 So far we have run 40 radiocarbon dates (16 from Birnin Lafiya) for sites of the area, and through survey we have identified, then described, about 800 up to now totally unknown archaeological sites. These are gradually building up the archaeological map of northern Benin. From the ethnographic side, we have carried out interviews with hundreds of potters, blacksmiths, weavers and dyers within the valley and the wider region. 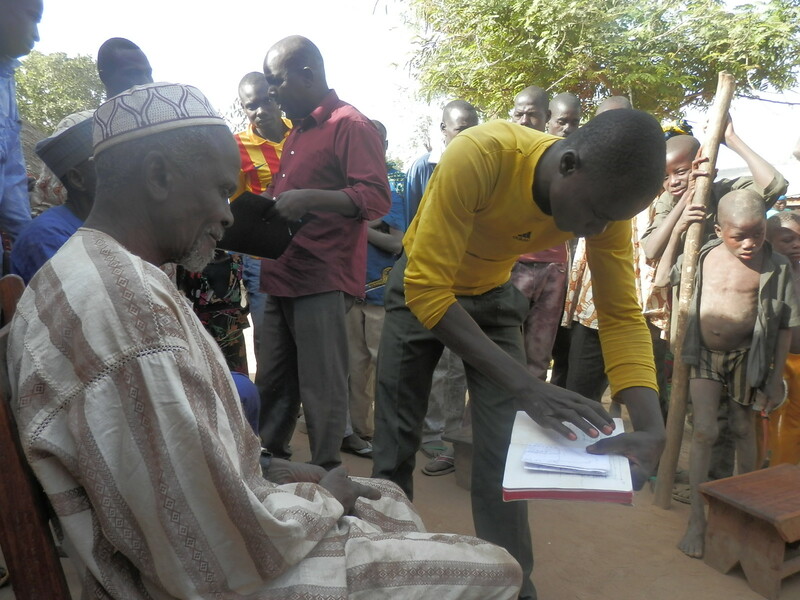 We also carried out intensive interviews as regards the political history of the area and the traditions relating to the abandoned sites near modern villages. Contemporary textile production has constituted an important element of our research, and one of the highlights of the 2013 field season was the commissioning of a local cloth, an operation set in motion and followed by one of the masters students associated with the project from its start (cutting the wood to make the loom) to its finish (the final textile, now part of the permanent collection of both the Sainsbury Centre for Visual Arts and the Horniman Museum of London). 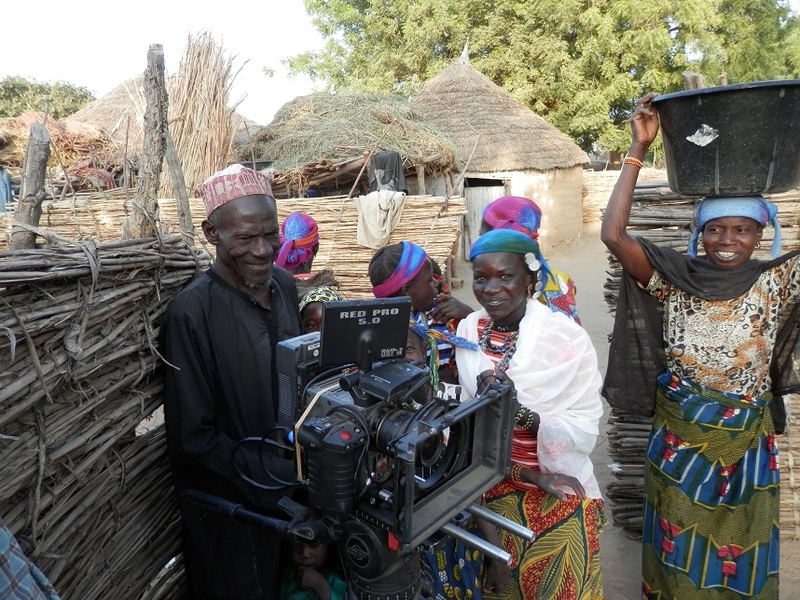 Thus far the evidence recovered through fieldwork offers good prospects to answer the questions set out by the research project, namely the degree to which areas of cultural and political evidence might be visible on the ground. The pottery, aerial imagery, and soils analysis are all in progress. The pottery analysis has also involved three students (as well as further students in the field). To date 42000 sherds of the have been placed on the database while we are also continuing manual recording. The aerial imagery analysis is being carried out by the project doctoral student; at this stage, it involves mapping the data of field survey, generating a digital elevation model (to seek correlations between terrain and site location), and using remote sensing imagery to locate sites from the air. The soils analysis aims primarily to recognise land use; to that end, samples have been taken both from archaeological trenches and from field systems and are being subjected to multi-element analysis. We’re also testing whether micromorphological analyses can provide clues as to the nature of the architectural structures recognised at Birnin Lafiya, and trialling the effectiveness of a dating technique called optically-stimulated luminescence. A book and four papers deal with aspects of all of this, and we’re planning a book for 2016 and some more papers. A first set of radiocarbon dates came back from the lab a couple of weeks ago. 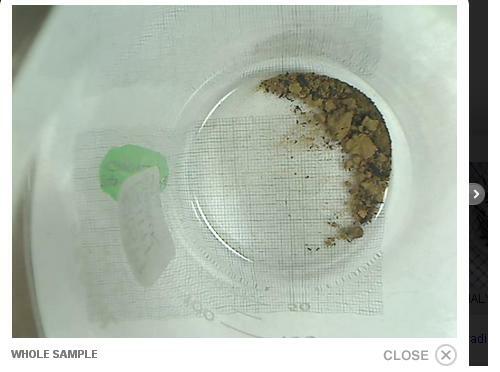 They were on samples which came mainly from our test pits at Tin Tin and Gorouberi. These are really interesting in that they confirm that those sites were for the most part inhabited in the latter part of the first millennium AD and the beginning of the second. Those pavements we dated at Tin Tin, for example, were apparently laid down around 1000 years ago. Gorouberi dates (six of them) range between 1100 and 1900 years bp, approximately – it’s our oldest site so far, dating from the time when Tacitus was writing his Historiae and Teotihuacan was flourishing near what is now Mexico City. To list as other achievements, most of the field reports are now in from the various team members, the pottery from Tin Tin, Kompa and Birnin Lafiya Trench IX are undergoing preliminary analysis, SCVA curators have been examining our earth monolith from TTK1, our MA students have made a comprehensive list of our small finds (metal points, stone beads etc. ), I gave a paper on our work at our Centre for African Art and Archaeology, and we had one of the intact, earth-filled pots from Birnin Lafiya Trench X put under the X-ray. We’ve also been thinking about sources of stone, lipids analysis, babbaji textiles and ground-penetrating radar. 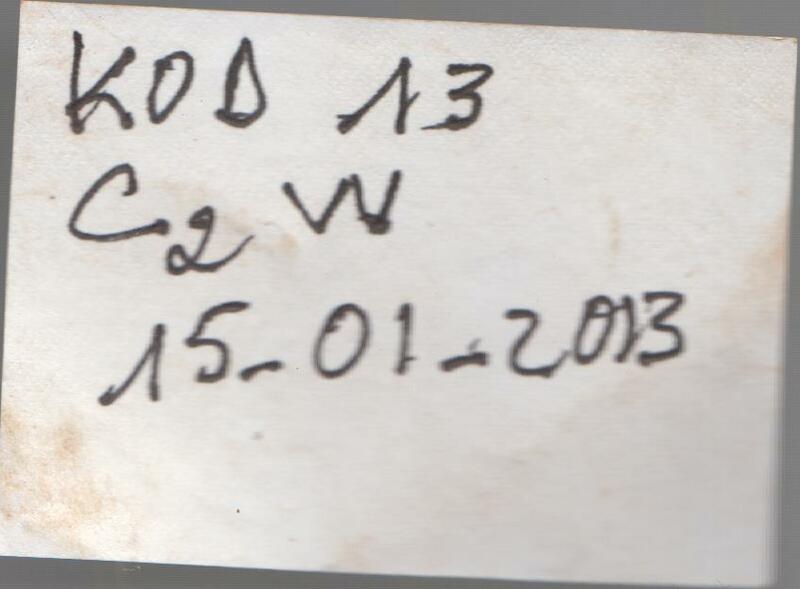 Keen readers will know that we recently submitted for dating a crop of 13 radiocarbon dates. Even keener readers will recall that we last year (2o11) had results ranging from the seventh to the thirteenth centuries: those were on trenches SI and SII. 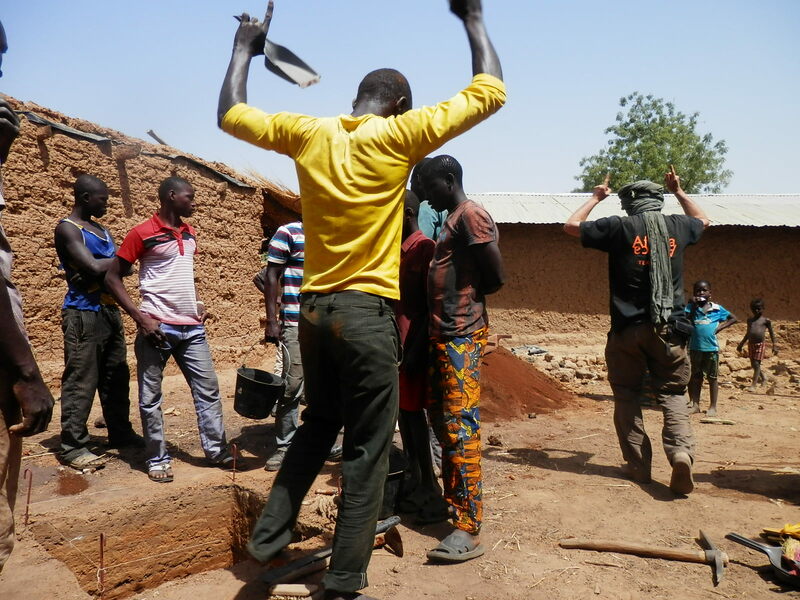 We now have results from our trenches at Birnin Lafiya as well as our work near Pékinga. The results are very good, in that they are both internally consistent and a little surprising. At Birnin Lafiya: Sam’s architectural pit, the students’ trench of interlocking pit features, Ali’s ashy midden, Nicolas’ trench, Louis’ baked earth feature. SIII – charcoal from the pottery fill between two pottery pavements – is 880 +/- 30 BP, which is to say, mid-eleventh to early thirteenth centuries AD. This is a little earlier than anticipated given proximity to the surface, but then it fits well with last year’s results from SII. SIV – a very deep pit – three samples were submitted, two from different parts of the base of the trench, 1540 +/- 30 BP and 1660 +/- 30 BP, one from a higher portion just above two interlocking pots, 1210 +/- 30 BP. Which, once calibrated, gives a range of fourth-sixth centuries AD and eighth-ninth centuries. There turned out to be, by the way, more than eight interlocking pit features. SV – ‘la poubelle du roi’ – an ashy midden with lots of fish bone and fine pottery – yielded two dates, really close together despite being 60 cm apart – 920 +/- 30 BP and 900 +/- 30 BP – essentially early eleventh to early thirteenth centuries. SVI – near the large baobab and with the mat/cordelette à armature multiple sherds – 1160 +/- 30 BP and 850 +/- 30 BP – late eighth to late tenth, and late twelfth to late thirteenth centuries respectively. This is actually pretty consistent with the other occupations, whereas we had thought we might be seeing something different, possibly earlier, there. SVII – 1270 +/- 30 BP – late seventh to late eighth centuries – from a collection of baked earth and ‘plaster’ fragments, essentially a surface feature so a surprisingly early date. At Pékinga – 610 +/- 30 BP and 1040 +/- 30 BP – seems a decent stratigraphic succession here and an excellent fit with the BLaf dates downriver. Ninth-early eleventh centuries and late thirteenth-early fifteenth centuries respectively. 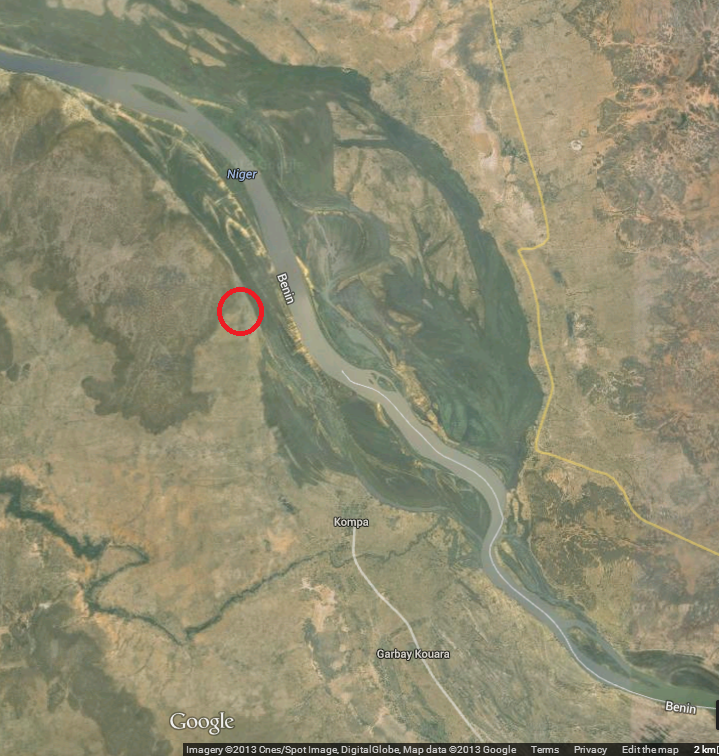 Here is a surprise ; the site in the floodplain, the Baobab site, candidate for earliest occupation, is in fact submodern! Interpretation will have to await a more propitious time of day but so far so good. Here is another sherd. A very fine twisted cord roulette underlies seven incised lines. The people of BLaf seem to have been very fond of combining rouletting – most often, folded strip rouletting rather than the twisted cord shown here – with incisions. This combination occurs commonly on the 640-plus sherds analysed as a pilot-study. As the analysis of this material is now complete, it will be returned to Bénin when we next go.